My hexagon geometric modern wool felt drink coasters are the perfect choice to protect delicate surfaces....beautifully! 100% Virgin Merino Wool Felt is durable, heat resistant, renewable, eco-friendly and a naturally fantastic material for coasters. Gently wicking, it will absorb moisture without soaking through. 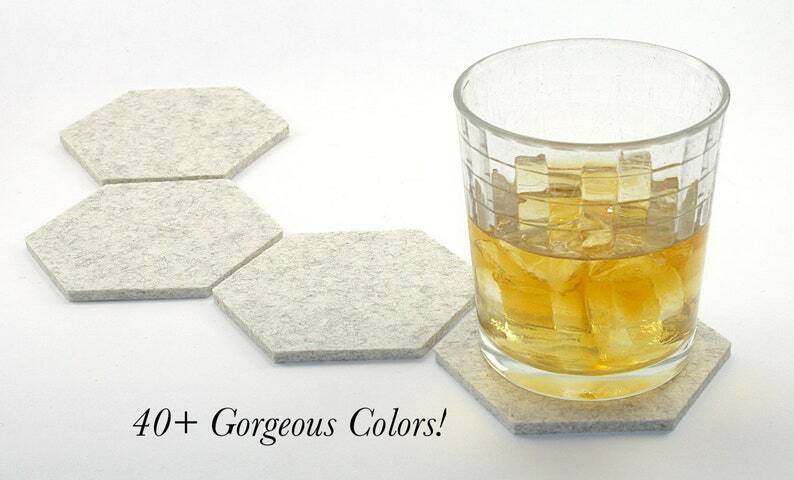 Light, but dense, these coasters won't ding tables or toes if dropped. My German crafted felt is Oeko Tex® 100 Certified Class II (contains no harmful substances) and safe for use in children's toy per EU Toy Safety Standard EN 17. Each coaster is precision die cut and measures 3 5/8" from flat side to flat side, and 4" from point to point. A luscious 5mm thick. Shown in Sandstone but available in all my vibrant, colorfast 5mm colors. For a mix, choose custom mix in the drop down menu and note your colors in the cart. Mobile users click on the picture and scroll to see my color chart. Spot clean, blot, don't rub, hand wash cold or dry clean. Items will be shipped in seasonally appropriate gift bag with coordinated tissue paper and raffia bow. Shipped on time. Very thick. High quality. Exactly as pictured. I accept Visa, MC, Amex and Paypal. 6% Sales tax will be collected for orders shipping to PA. I offer a no regrets, 100% satisfaction guarantee and accept returns of standard items, for any reason, as long as the item(s) is returned in new, unused, sellable condition. I am also happy to make exchanges. Standard items ship within 3 business days, custom items in 5 business days. I will send tracking when your item ships, and if for any reason there will be a delay in shipping I'll let you know. If you have any special requirements let me know! For my overseas customers, please be aware that the postage you pay to me is in turn paid to the US Postal Service to ship your package. It does not cover any taxes, fees or handling charges imposed by your government for imported items. You will be responsible for any charges added by your government. I do not include paper invoices in an effort to conserve resources that are likely to be tossed out anyway. If you would like a printed invoice just let me know! A tape type lint roller is best for dry debris. Potentially staining liquid spills should be blotted up. As wool is stain resistant this will take care of most issues. If any residue is left behind blot again (never rub) with a damp soapy cloth or sponge until gone, finish with a water moistened cloth or towel to remove any soap (still blotting) then blot dry. If an overall cleaning is desired, you can machine wash your items on hand wash/gentle cycle, cold water, I use Tide®. Remove promptly and dry flat. NO DRYER! Machine washing will make the felt a little loftier, but it will retain its durability and beauty. Items may be ironed, if needed, on the wool setting when they are completely dry. Wool felt can also dry cleaned. I do offer wholesale pricing on some items to select brick and mortar shops. I love custom requests, but do not offer personalization at this time.